First round play will resume at 7:30 a.m. on Friday, Sept. 18. Gates will open to spectators at 7:30 a.m. Due to current and expected inclement weather conditions, second round tee times are now scheduled from 9–11:01 a.m.
Exit from I-94 onto IL-132 E/W Grand Avenue. Complimentary shuttle service will also be provided to and from the BMW Championship from the two Lake Forest Metra stations: Milwaukee District/North Line and Union Pacific/North Line. Spectators can walk, bike to or be dropped off at the Metra stations to take the convenient shuttles to the course. Vehicles dropping off guests must do so at one of the two Lake Forest Metra stations. Complimentary shuttle service will be provided to and from the BMW Championship. Live coverage of the BMW Championship will resume on Golf Channel immediately following the conclusion of the Solheim Cup coverage (at approximately 11 a.m. CT). 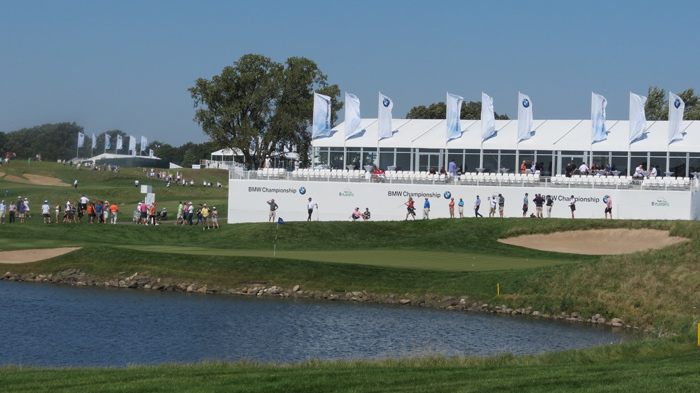 Visit www.BMWChampionship.com or follow on Twitter: @BMWChamps for the most up-to-date information.